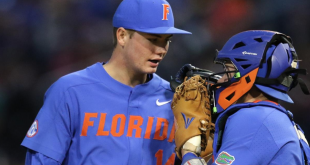 The top ranked Gators baseball team continues a string of games against Florida schools when it hosts Florida Atlantic tonight; you can hear the game live starting at 7pm on WRUF Sports Radio 850. 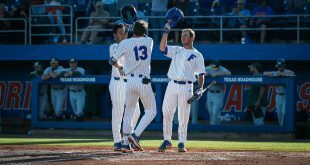 Florida (10-1) comes off a series sweep last weekend at Miami while the Owls (8-4) by comparison have lost to Miami earlier in the year. 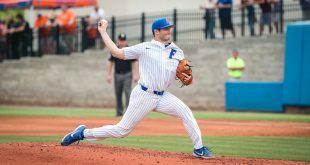 The Gators will start freshman lefty Bobby Poyner who will make his first collegiate start in this game; he’ll be opposed by junior righty Jake Meiers who is 1-1 with a 7.59 earned run average this year. 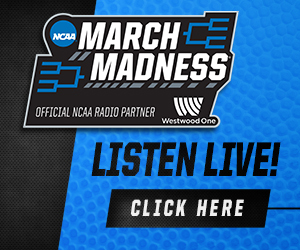 The Owls hit .303 as a team but they will be without two of their best offensive players tonight who are out with injuries. Senior outfielder Alex Hudak (.421) and infielder Robert Buckley (.350) will not play and their bats could be significantly missed.